Thank you for being a member of IANDS!! Your membership helps provide the crucial financial support for IANDS to pursue its mission of research, education and support. Our goal is a future in which people of all walks of life, religions and cultures will look at near-death experiences as a potential source of meaning and inspiration for a better world. We truly look forward to having you as part of our organization for another year! New to IANDS? Click here to Join. To renew online, select one of the links below. You will be prompted to login if you haven't already. NEW! Optional automatic yearly renewal (recurring charge) can be selected or dropped on your membership profile page. To renew by mail, phone or fax, instructions are provided at the bottom of this page. Is my membership tax deductible? Click here. Vital Signs, our quarterly magazine filled with information about NDEs, current research, articles about related topics, and news about IANDS. Click here for sample articles. Annual IANDS Conference Registration Discount. The Supporting membership level is the most popular membership level. 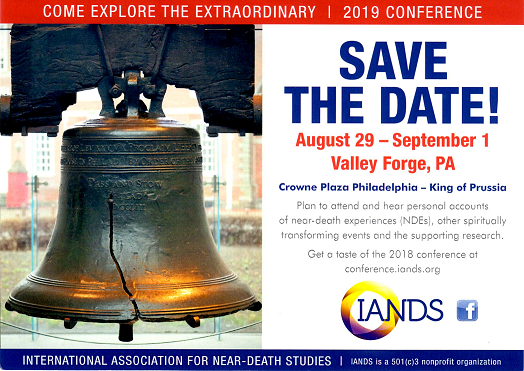 It provides the extra financial support IANDS needs to accomplish its mission of encouraging research into NDEs, supporting experiencers as they attempt to integrate their NDE into their lives, and educating professions (healthcare, clergy, educators, etc.) and the general public about NDEs. We hope you can renew at this membership level to help us create a future in which people of all walks of life, religions, and cultures will look at near-death experiences as a potential source of meaning and inspiration for a better world. Professional Membership for $125 annually ($20 off for seniors - 65 and older - and full-time students) – for those seeking the most information on NDEs. Access to and a free listing in the Professional Networking Directory, a database of contact, work, and interest information about each participating IANDS member at the Professional or higher membership levels, and available only to those members. This membership level, and those below, significantly contribute to IANDS' ability to accomplish its mission and have an impact on the world. For the above prices, add $14 for outside the US (rate increased on 3/1/13 due US mail rate increases). Send it to us along with your check, money order or credit card information ($US funds only). Click here for the IANDS address and phone number to contact us during business hours (USA East Coast time) if you have more questions, or with your credit card information. IANDS is recognized as a 501(c)(3) non-profit organization by the United States Internal Revenue Service.